Agency Power Plus 1 Front Brake Caliper Bracket PORSCHE - Dezod Motorsports Inc - Home of the automotive performance enthusiast since 2002. The Porsche 996 Turbo and C4S model was designed and built with high performance braking in mind. However, this amazing platform has now become a popular vehicle for the track use. With track racing comes the needs for improved braking over what the stock 4piston 330mm brakes can handle. Brake engineering at the simplest is about how you can have clamping force over a large surface area and dissipate the heat to keep the brakes from fading. What Agency Power has engineered is a Plus 1 Bracket Kit which allows you to take the factory 4piston 330mm brakes and upgrade to the 350mm OEM rotors that are found on the Porsche 997 Turbo. This bracket kit is essentially a spacer that goes between your caliper and the wheel carrier to allow your caliper to fit over the larger rotors. The larger rotors will give you increased surface area to provide you better braking and longer pad life. Our brackets are CNC machined 6061 aluminum to keep the weight down. Since this is an important safety component, we have had the brackets hard anodized. The kit includes longer bolts needed to install as well as new washers. 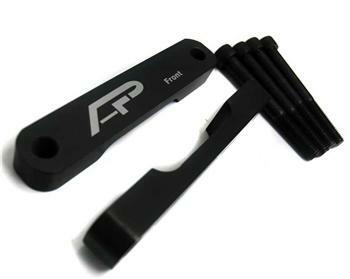 Each bracket is laser engraved with the AP logo and if it is a front or rear unit. Each Kit is sold as a pair of fronts or pair of rears. These kits fit all 2001-2005 Porsche 996 Turbo or C4S with standard non ceramic brakes.